Leading a busy lifestyle is even more reason to stay healthy. This versatile blend is a great way to get the nutrients your body needs in a fast, convenient way. Ideal for hot and cold drinks, smoothies, protein balls or puddings and great for home, work, travelling and camping. During a 13-hour flight home from LA to Brisbane, Cyndi hadn’t had time to organise her own food so from samples she had received at a food fair during the trip, she mixed water with some freeze-dried coconut, cacao, chia seeds and a few other ingredients. After 5 minutes, Cyndi had a beautiful Cacao Chia Pudding which was enough to satisfy her for the whole flight! When she returned to Australia, Cyndi started work straight away with the Changing Habits team to develop a mix that would give you a quick hunger fix. 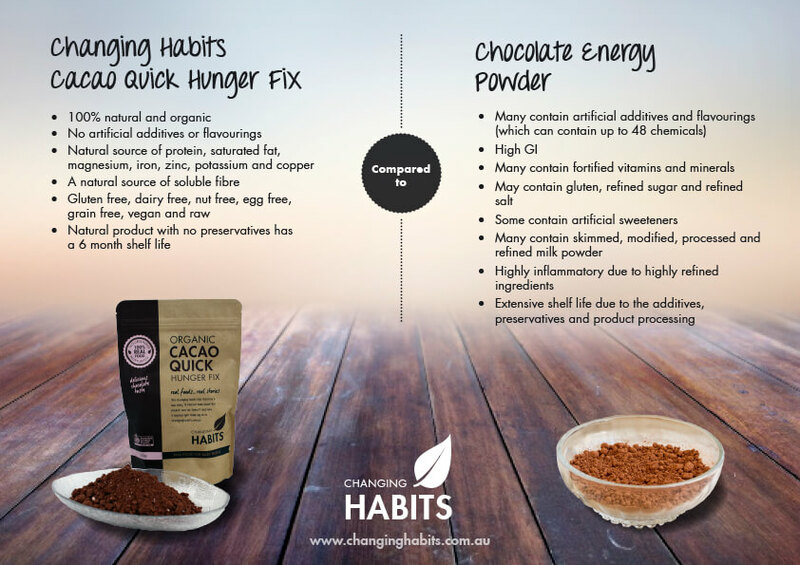 Organic Cacao Quick Hunger Fix is a blend of nutritious and flavoursome ingredients which can be added to smoothies, used to make a hot drink, added to raw treats and baking or mixed with chia seeds to make a meal on the go. The mix is a blend of organic inca inchi powder, cacao, coconut sugar, freeze dried coconut and banana, mesquite, lucuma, Ceylon cinnamon and salt. Each of these products have been carefully chosen for their flavour and nutritional benefits to make this wonderful go to mix when you need food fast. Our organic hunger fix is a natural source protein, dietary fibre and minerals such as magnesium, phosphorus, iron, zinc, manganese and copper.